jury service if they have illnesses that would interfere with their ability to do a good job, would suffer great hardship if required to serve, or are unable to serve for some other reason. You are here because you were found to be eligible for jury duty and were able to serve. You are now part of the 'jury pool', the group of people from which trial juries are chosen. 1. What is the job of a juror? 2. What is the job of a judge? 3. What qualities should a good juror have? 4. What requirements should one meet to be eligible for jury service? 5. What are the reasons for a person to be excused from jury service? 6. What is a jury pool? в имеющие неснятую или непогашенную судимость; е признанные судом недееспособными. Any request for excusal or postponement must be received at least 7 days prior to your report date. You will be notified by mail regarding the status of your request and postponement date, if applicable. the people involved in the case. Many of the questions the judge and lawyers ask you during Voir Dire may seem very personal to you, but you should answer them completely and honestly. Remember that the lawyers are not trying to embarrass you, but are trying to make sure that members of the jury do not have opinions or past experiences which might prevent them from making an impartial decision. During Voir Dire the lawyers may ask the judge to excuse you or another member of the panel from sitting on the jury for this particular case. This is called challenging a juror. There are two types of challenges. The first is called a challenge for cause, which means that the lawyer has a specific reason for thinking that the juror would not be able to be impartial. For example, the case may involve the theft of a car. If one of the jurors has had a car stolen and still feels angry or upset about it, the lawyer for the person accused of the theft could ask that the juror be excused for that reason There is no limit on the number of the panel members that the lawyers may have excused for cause. asking that the juror be excused. Like challenges for cause, peremptory challenges are designed to allow lawyers to dn their best to assure that their clients will have a fair trial Unlike challenges for cause, however, the number of peremptory challenges is limited. Please try not to take offence if you are excused from serving on a particular jury. The lawyer who challenges you is not suggesting that you lack ability or honesty, merely that there is some doubt about your impartiality because of the circumstances of the particular case and your past experiences- If you are excused, you will either return to the juror waiting area and wait to be called for another panel or will be excused from service, depending on the local procedures in the county in which you live. jurors. The judge may also allow selection of one or more alternate jurors, who will serve if one of the jurors is unable to do so because of illness or some other reason. L What is the aim of Voir Dire? 2. What does the procedure of Voir Dire consist of? 3. What is challenging a juror? 4. What arc the types of challenge? 5- Why is the number of peremptory challenges limited? 6, What aims do lawyers pursue while challenging jurors? 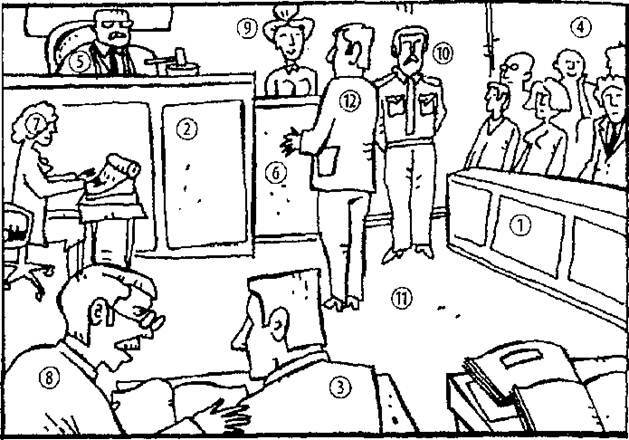 7, What is the number of jurors sitting on a case? 8, Who are alternate jurors? мотивированный отвод присяжных заседателей. В результате остаются 12 основных и 2 запасных присяж­ных заседателя. От исполнения обязанностей присяжного заседателя по кон­кретному делу председательствующий судья освобождает вся­кого, чья объективность вызывает обоснованные сомнении вследствие оказанною на это лицо незаконного воздействия, на­личия у него предвзятого мнения, знания им обстоятельств дела из непроцессуальных источников, а также по другим причинам. to , , ._.. jury service when summoned. the jury has deliberated for more than two hours provided that, in the normal jury of 12 people, there are no more than two dissenters. the panel, giving reasons for doing so. In Scotland the prosecution or defence may challenge up to three jurors without reason. In Northern Ireland each defendant has the right to challenge up to 12 potential jurors without giving a'reason. years or more is for life. Jury — a group of twelve men who, having Ued to the judge about their hearing, health, and business engagements, have failed to fool him. The number of the days you work as a juror and your working hours depend on the jury selection system in the county in which you live. Working hours may also be varied by the judge to accommodate witnesses coming from out of town or for other reasons. Regardless of the length of your working day, one thing that may strike you is the amount of waiting. For example, you may have to wait a long while before you are called for a jury panel. You also may be kept waiting in the jury room during trial while the judge and the lawyers settle a question of law that has come up. Your having to wait before trial is important for the efficient operation of the system, Because there are many cases to be heard and because trials are expensive, judges encourage people to come to an agreement in their case before triaL Theso agreements, called settlements, can occur at any time, even a few minutes before the trial is scheduled to begin- This means that it is impossible to know exactly how many trials there will be on a particular day or when they will start. Jurors are kept waiting, therefore, so that they are immediately available for the next case that goes to trial. 1. What does a juror's working day depend cm? 2. What is a settlement? 3. When and why are jurors sent out of the courtroom during trial? In addition to the lawyers and the judge, three other people will play an important role in the trial. The court reporter, who sits close to the witnesses and the judge, puts down every word that is spoken during the trial and also may record the proceedings on tape. The clerk, who sits right below the judge, keeps track of all documents and exhibits and notes down important events in the trial The bailiff helps to keep the trial running smoothly. The jury is in the custody of the bailiff, who sees to the jurors comfort and convenience and helps them if they are having any problems related to jury service.